“Mystic Masters” refers not so much to a specific way of putting on paint or sculpting clay, but more, perhaps, to a way of paying attention. It might be expressed as the faithful recording by the monks or scribes of a particular place-in-time, such as can be seen in the aquarelles of Paul Hansen. 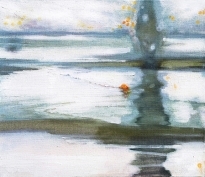 Or it might be seen in the soft-focus work of Maggie Wilder, using a diffuse and non-aggressive way of looking and of knowing a subject, a search for the “glow in all things”. Mysticism can also be seen in the lively dance that William Slater made in paint, celebrating not only subject, but the act of painting itself. Or it could be found in the delicate ikebana paintings of Morris Graves, studies not about the way things reflect light, but the beauty of life itself. William Slater came to the Skagit Valley from New York City in 1972 and found solace and refuge in the marshlands of the Skagit River estuary, where he made a series of homes from shacks. He brought with him a love a boats and the painterly language he shared with his friend Mark Rothko. He was, by turns, reclusive and gregarious, intellectual and sensual. His paintings express a love of figures and volumes of atmosphere, but most of all, a love of the act of painting itself. William Slater died in 2007. Clayton James was a first wave transplant to the Skagit Valley, sharing a rented farmhouse for retreats to La Conner with his wife Barbara, Morris Graves and Richard Gilkey in the late forties, until he and Barbara bought the home for themselves. Clayton was an internationally know sculptor, woodworker, and later, a practitioner of plein-air painting. He was also a conscientious objector and a pacifist who eschewed personal recognition for a life of quiet pleasures and steady work. He walked to his studio daily into his nineties. Clayton James died in 2016. Paul Hansen is a painter, poet, calligrapher and Chinese scholar. His work as an artist is devoted to a painstaking process of observation of site-specific landscapes. There are no generalizations. Details are recorded in calligraphic markings, building the scene over weeks and sometimes months, with aquarelle medium and a completely dispassionate eye, finding all features equally compelling and worthy of attention. After many years living in China, Paul has returned to the Skagit Valley and lives on the Swinomish Reservation. Theodora Jonsson is a painter and glass artist. Her work is directly influenced by the energies she senses in the land, air and water. Exploring the geology of the Pacific Northwest and British Columbia coastline by foot and by boat throughout her life have left deep impressions and a personal vocabulary that expresses an intimate relationship that we might have to land and its inhabitants if we only listened more carefully. Theodora lives and works in the Chuckanut foothills. John Simon was a Midwesterner who found an immediate kinship with the migrating salmon and birds of the Skagit Valley. He steeped himself in the legends of the Salish people and worshipped nature spirits. He longed to be as innocent and pure of intention as the animals who enthralled him. He lived for many years in a barn on Fir Island. John Simon died in 2010. Maggie Wilder is a painter and filmmaker who lived for 23 years in a cabin in what was known as Fishtown on the Skagit River. She is known for paintings celebrating dusk, estuaries and the glow in all things. She finds her painting practice thrives in symbiosis with yoga and meditation. Maggie now lives in La Conner in the house first used by Richard Gilkey, Morris Graves and Barbara and Clayton James. Defiance, etching 20/24 16 x 12"
House on the S-Curves Aquarelle 22.5 x 22.5"
Winter Electricity Three Acrylic on Canvas 20 x 20"
September Fishtown o/c 11 x 13"